As a newcomer to Volcan I was pleasantly surprised to find that there was a warm and welcoming expat community. 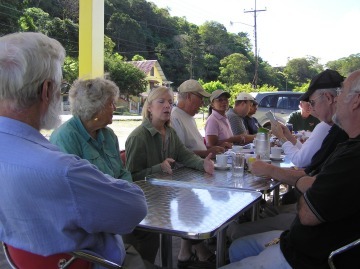 A group of about ten people from Canada, Europe and the US regularly meet for breakfast at Volcan’s newest restaurant – Dalys’s. It’s pronounced the same as Alice’s, and, just like the restaurant from the old pop song, in this restaurant you can get just about anything. I was told there were upwards of 35 places to eat in Volcan – I was skeptical until I took a short trip across town and counted them – in truth the figure is closer to 40. So what makes Dalys’s special? Well two things really, the unbelievable low prices and the equally incredible quality of the food. I can’t explain how good the food is – that’s’ something you have to come here and taste for yourselves, but price I can show. Coffee, with two or three free refills, runs at 40 cents. A beer 75 cents and a generously filled glass of wine $1.00. 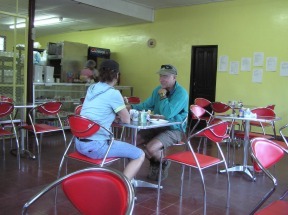 True, most Panamanian restaurants in Volcan are not expensive either, but can they serve a gourmet plate of Japanese or Pennang curry and rice for $1.50. or an enchilada dinner for $2.50? The owners are Dalys and Don Miller. Dalys is a local from the nearby small town of Caizan. Don however, spent nearly 30 years in Hawaii as an electrical engineer, but his true passion must have been cooking. 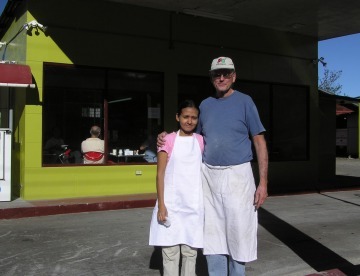 Hawaii’s loss is Panama’s gain because Don makes the best cinnamon buns in all of Chiriqui. Gene Robinson, a retired homeland security officer from Florida, admitted he was addicted to the cream covered delights. One morning he tried his first bun as a breakfast snack. This was followed immediately by a second . . . and then a third. 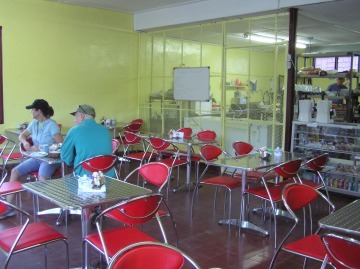 A local property owner was amazed when ordering an omelete for breakfast, why? because Don Miller gave him a choice of cooking oil. Don’s choice for cooking on most occasions is the pricey olive oil. The difference is the taste. The food at Dalys’s is never greasy. Lamentably most of the other Volcan restaurants have something to learn in this respect. Coming soon a farmer’s market. Don and Dalys have their sights set on a small expansion project. 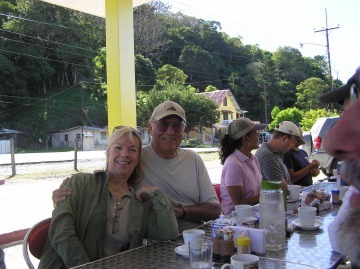 The restaurant was originally Volcan’s first gas station. So it has plenty of space for vehicles to park and drive through. Hopefully in the New Year, on Wednesdays and Saturdays, the ample sized parking lot will be home to a dozen small stalls selling everything from fruit to organic vegetables. Local artists and crafts people have also voiced their delight that finally Volcan will have a place for them to display and sell their art. Dalys’s restaurant is a welcome addition to Volcan. It will not only become a focal point for expats to meet and enjoy breakfast, but it might just change the whole profile of this small mountain town. As I sat outside on the patio of Dalys’s this morning, there were high puffy white clouds framing a deep blue sky. A warm but refreshing breeze rustled through a nearby palm tree. Sipping a cup of coffee and enjoying a walnut brownie, I thought about my new life here in Volcan. And I thought about my friends back in Canada. If they were with me now – I think half of them would never leave.